Notes Started when the jeep arrived so most of the hike in the dark, many lodges on the way. Slept at Center Sherpa lodge. 150NRP for sleep, vegetable soup – 200NRP, pancake apple+honey – 250NRP, free charging. Sleeping altitude – 2700m. Hiking distance, time & elevation 18,5 kilometers. 8 hours. 1300 vertical meters. Notes Started around 7:30 in the morning, steep hike until Taksindu La, old stupas on the way. Getting down until Great Martyers gate and suspension bridge. Altitude – 1500m. 3 oranges for 90NRP. 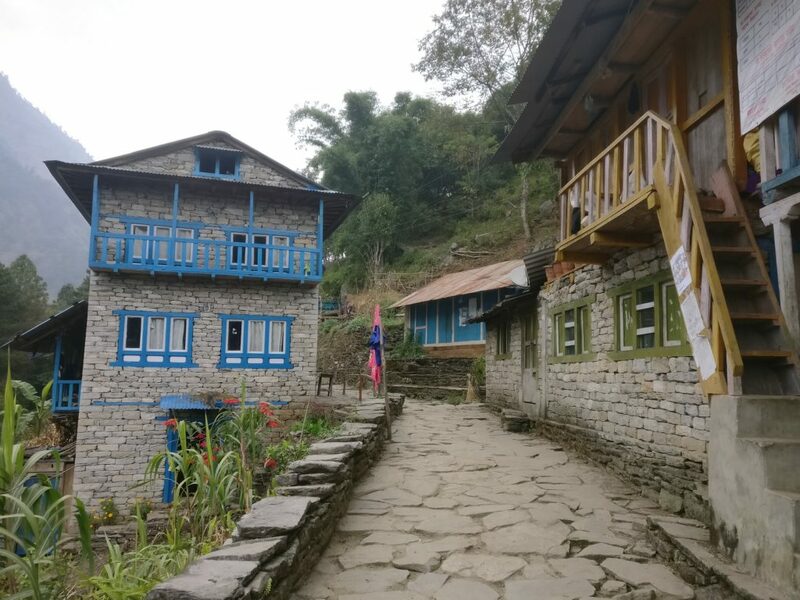 Slept in Bupsa – Sundup lodge run by Pemba Janbu Sherpa. Veg potatoes + egg – 450NRP, apple pie – 400NRP, oat meal with milk – 400NRP. Sleep was free. Sleeping altitude – 2540m. Hiking distance, time & elevation 22,5 kilometers. 9 hours. 1150 vertical meters. Notes Started 7:30, hiking up. ~2:45 to Puiya. Lunch after Surke and ncell started to work. Arrived to Buddha lodge in Phakding. Milk tea – 100NRP, apple pie – 350NRP, veg. Fried noodles – 450NRP. Breakfast plain porridge – 400NRP. Sleep was free. Sleeping altitude – 2610m. Hiking distance, time & elevation 15,7 kilometers. 10 hours. 1300 vertical meters. Notes Left at 8:00. At 9:30 reached entrance to Monjo, municipality fee&ticket 2000NRP, 10 minutes after that reached Sagarmatha national park checkpoint, 3000NRP for ticket, no photo needed, guides try to avoid the line. Found a geocache in Jorsalle. 13:50 at Namche Bazar. Namaste lodge 100NRP/person. Everest bakery – chocolate pie – 350NRP. Veg fried noodles 470NRP. Pancake with jam 360NRP, muesli with milk 360NRP. Sleeping altitude – 3440m. Hiking distance, time & elevation 16,6 kilometers. 8 hours 30 minutes. 1260 vertical meters. Notes Left at 8:30. At 11:10 reached ticket counter for Tengboche/Pangboche/Debuche, price 500rp for a room (1-3 people). 13:20 reached Tengboche bakery. From bakery wen to Stupa and reached it at 14:20. Stupa altitude – 4200 meters above sea level. 14:40 back to bakery. Apple scramble – 450NRP + milk tea – 100NRP. 16:45 at Pangboche. Sleeping at Highland Sherpa resort. Vegetable noodle soup 395NRP, spaghetti with tomato sauce and cheese 545NRP, half portion of Momos 250NRP, oat porridge with hot milk 355NRP. Sleeping altitude – 3900m. Hiking distance, time & elevation 16,7 kilometers. 8 hours. 1200 vertical meters. 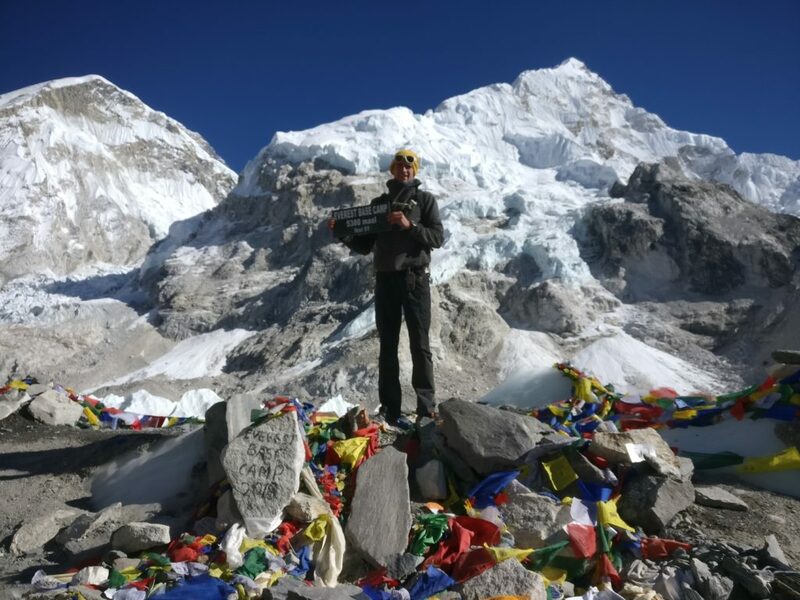 Notes 7:20 left to Ama Dablam BC. Total 2 hours 20 minutes to BC, 3 hours 45 minutes to go there and back to lodge. Ate noodles + veg. Soup for 395NRP. 12:05 left lodge. Checkpoint in Shomare – 500rp for room (1-3 people). Arrived to Dingboche around 14:45 – Valley view lodge. Bakery in Dingboche “Cafe Himalaya”, showing Sherpa movies from 2pm. apple pie 500NRP, milk tea 200NRP. Dal bhat 690NRP, oat porridge with milk 410NRP. Sleeping altitude – 4300m. Hiking distance, time & elevation 14,6 kilometers. 10 hours. 1760 vertical meters. Notes Hard day. 7:20 left to Nangartshang. Took me 2 hours 20 minutes to the summit, 9:40 there. 3 hours 20 minutes up&down, 10:40 back to lodge. 11:20 left lodge. 13:30 arrived at Sunset eco lodge in Chukung, arranged island peak for 500$ (200$ cash, 300$ card + 30$ commission). 14:12 left for Chukung Ri. 16:10 Chukung Ri (left summit on the pass). 17:20 back to lodge. Everest link card 600NRP – 1gb. Dal bhat 600NRP, porridge 470NRP. Sleeping altitude 4750m. View from Kongma La pass. Hiking distance, time & elevation 11,2 kilometers. 8 hours 30 minutes. 1000 vertical meters. Notes Woke up 6:30. 8:30 leaving the lodge for Kongma la. 13:45 on the pass. 17:00 in the Italian pyramid. Agreed 30€ for hot shower + wifi + dinner + breakfast. Definitely the best place to stay on the trail with running hot water. Sleeping altitude – 5050m. Hiking distance, time & elevation 13,7 kilometers. 9 hours. 860 vertical meters. Notes Woke up 6:30, oat meal porridge with 2 boiled eggs for breakfast. Left the lodge at 8:20. 2hr30min to Gorakshep, at 10:50 arrived there. Staying at Everest inn. 11:40 left lodge to EBC. 13:05 at the EBC, many people taking photos. Rara noodle soup – 550NRP, tomato noodle soup – 550NRP, apple porridge – 600NRP . Hiking distance, time & elevation 11,6 kilometers. 6 hours. 140 vertical meters. Notes 8:45 leaving the lodge. 11:30 at the bakery in Lobuche (highest bakery in the world!) – apple pie – 500NRP, chocolate muffin – 400NRP, black tea – 200NRP. 14:30 arrived to Dzhongla. 800NRP for mixed fried noodles (tuna, veggies, cheese), huge portion. Musli with milk – 600NRP, hot chocolate – 150NRP, oat porridge – 600NRP. Sleep – 500NRP. Sleeping at Dhongla Inn. Sleeping altitude – 4820m. Hiking distance, time & elevation 12,7 kilometers. 9 hours 20 minutes. 800 vertical meters. Notes 8:05 leaving the lodge. 12:25 at the pass. 14:45 arrived at Dragnag Tashi Friendship lodge and had tomato soup. Tomato soup – 500NRP, fruits cocktail – 500NRP. 15:30 left the restaurant. 17:30 arrived at Fitzroy Inn in Gokyo. Sherpa stew – 600NRP, black tea – 80NRP, apple pie – 450NRP, rice pudding with apple and raisin – 650NRP. 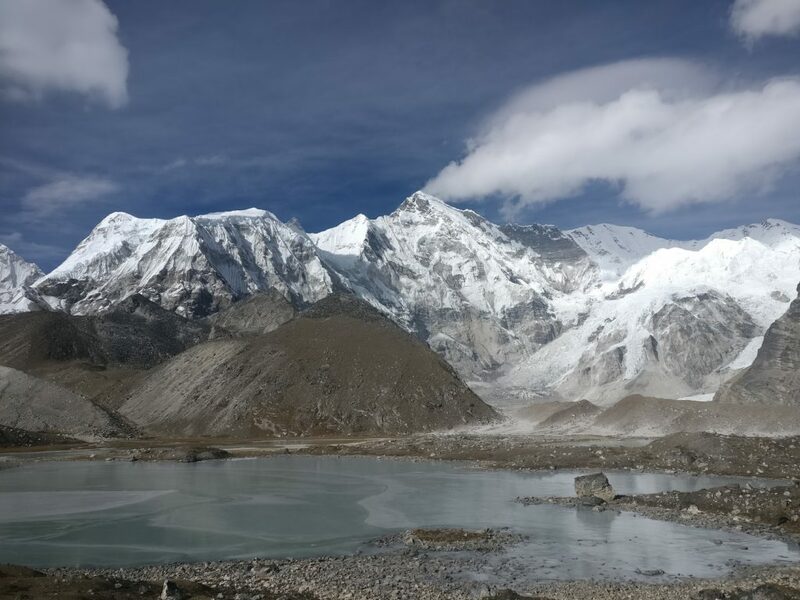 Cho Oyu basecamp at 6th lake. Hiking distance, time & elevation 19,4 kilometers. 7 hours 15 minutes. 530 vertical meters. 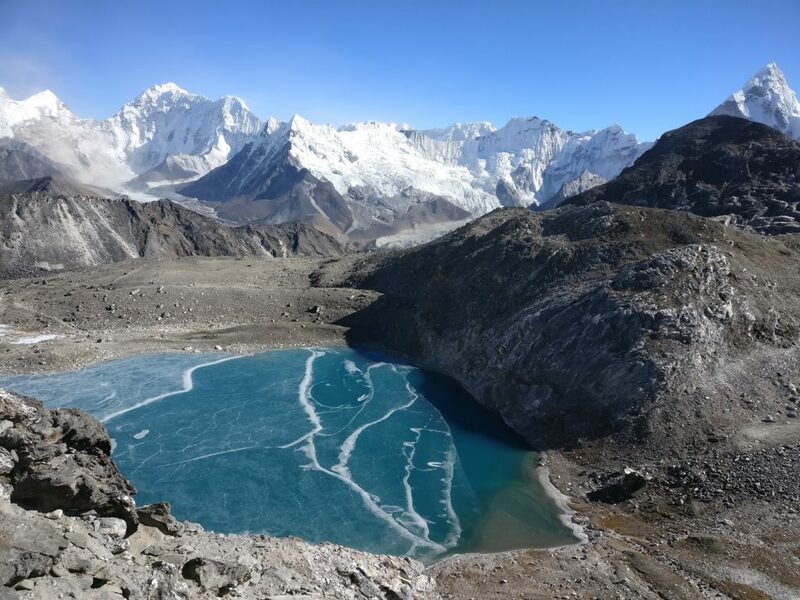 Notes “Rest day” in Gokyo – time for lakes. 9:15 left for the lakes. 1hr to 4th lake, 2hr20min to 5th lake, 4hr15min to 6th lake. Total 7hr10min back to lodge. Had a great jak steak. Jak steak – 1000NRP, black tea – 80NRP, mocca pie – 500NRP, Champa porridge – 500NRP. Sleep for 2 nights – 200NRP. Hiking distance, time & elevation 29 kilometers. 11 hours 30 minutes. 880 vertical meters. Notes Today was a long day. Found a geocache in Gokyo and at 7:20 left the lodge. 3hr15min to the top of the pass. 13:20 at the first village Sherpa Stew – 400NRP, coke – 400NRP. 14:00 leaving further. 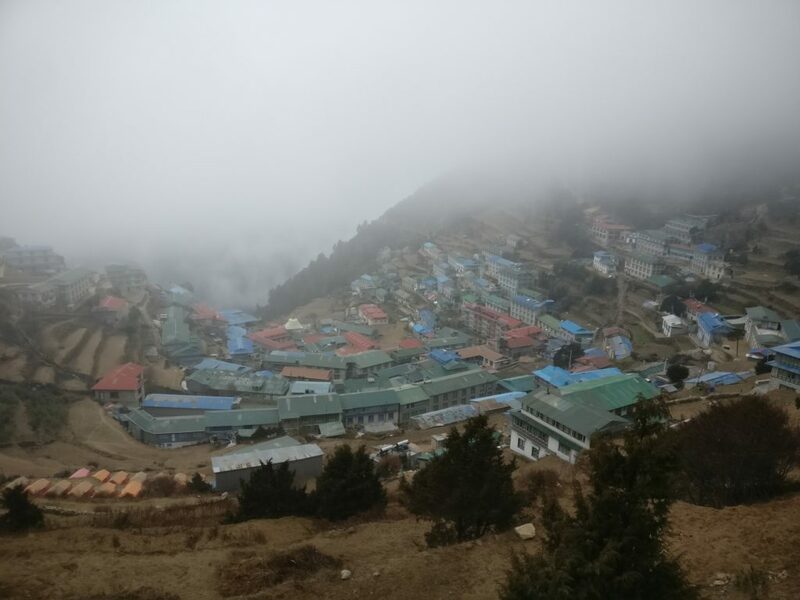 Arrived to Namche in the dark and stay in Namaste Lodge, room 100NRP, jak steak – 750NRP, apple pie – 480NRP, fanta – 330NRP, oat meal – 360NRP. Hiking distance, time & elevation 19 kilometers. 7 hours 15 minutes. 500 vertical meters. Notes Bounty + Sprite 150NRP+200NRP in the shop. Chocolate cake – 350NRP & milk tea 200NRP at Everest bakery (best bakery in Namche Bazaar). Leaving bakery at 9:50. Carrot+orange on the way – 100NRP. 13:50 lunch time before Phakding. Noodles soup with veggies 350NRP, apple pie 350NRP, milk tea 80NRP. Staying at paradise lodge&restaurant in Lukla. Yak burger – 800NRP, black tea 50NRP, mushroom soup 200NRP, porridge 250NRP, room 200NRP, black tea 50NRP, agreed that charging would be free. Sleeping altitude 2840m. Hiking distance, time & elevation 23,7 kilometers. 9 hours 45 minutes. 1140 vertical meters. Notes Leaving lodge at 7:10 to geocache. 1hr30min to go there and come back (~5 kilometers). Apple 50NRP, orange 50NRP, big banana 100NRP, 2 packs of cookies 100NRP, cola 150NRP in Lukla. 9:15 leaving Lukla to Bupsa – Apple pie 400NRP, noodle veg soup 300NRP. 17:00 arrived to Kharikola – Namaste lodge. Fried potato + veg + egg 400NRP, fanta 200NRP, apple pie 400NRP (very good!). Oat meal porridge with milk 250NRP. Sleeping altitude – 2000m. Hiking distance, time & elevation 29 kilometers. 10 hours 40 minutes. 1730 vertical meters. Notes Leaving lodge at 7:00. 2 oranges 50NRP, 2 kiwi 20NRP, 2 packs of cookies 50NRP. Noodle soup in Nunthala at 10:40 for 130NRP. Just before Phaplu – soup 150NRP, orange 20NRP, coke 150NRP, 8 samosas 240NRP. Sleeping at The hill view Guest house, Salleri – 300NRP room, 350NRP for chicken chowmein. So it took me total 16 days from Phaplu to Phaplu through Everest basecamp, Kalla Patthar, Gokyo lakes, three passes (KongMa La, Cho La and Renjo La). It was great adventure and I can definitely recommend it for others. 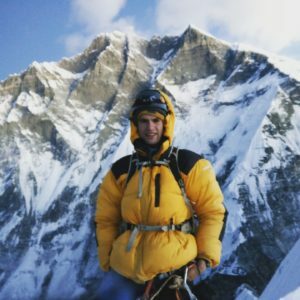 Duration of the hike – 16 (18 days with Island Peak climbing). Total distance of Three Passes trek – 310 kilometers. Jozef, thanks for Your discription of trek. I printed it and it was very usefool for my trek in Nepal. I did almost same route as You. Few thinks has changed since last year. In SoloKumbu every room cost 500 NRP and for Island Peak in Chukhung in Summer Eco Lounge they charge me 100$ more.